We envision a 10 episode season with each episode running 45 to 60 minutes. The nature of the premise, as a sci-fi / horror detective story with ongoing, incredible discoveries, allows for a non-stop cycle of thrills and chills. The initial story arc covers the first 10 episodes with additional storylines allowing it to continue for several seasons. The series is contemporary and set mostly in the United States with occasional locations around the world when dictated by events. While visual effects play a major role, the main characters, with their complex motivations and relationships, are the lens through which we follow an extraordinary quest to solve the mystery of The Box. First responders find the entire crew slaughtered. There’s blood everywhere; splattered on the walls and pooled on the floors, and limbs have been viciously torn from bodies. When molecular biologist Helen Davies and her team arrive at a shipwreck on the northern California coast, the first thing they see is the box; a large, colorless, non-reflecting cube chained to the deck. Sketchy information tells them the captain and crew believed their cargo valuable. But what killed them? Dr. Davies makes arrangements for a facility in Eugene, Oregon so the cube can be moved there for examination, but attempts to penetrate its surface and gain information prove daunting. Meanwhile, on the southern Oregon coast another massacre is reported. Hearing this, Davies heads to Port Orford where she hooks up with investigating Sheriff Dan Reed, and together they find a major clue – tracks on a sand dune near the killing ground, tracks that indicate a tall, bipedal animal. More killings in Coos Bay cause them to race up the coast where locals have trapped “something” in a cave on the beach. When Davies and Reed arrive, eerie howls echo from the cave as the locals hatch a plan to blow up the sea monster they believe is inside. Davies pleads with them to wait for a military capture, but she’s ignored and all the dynamite from town is set off at the cave entrance. After the massive explosion seals the cave, Davies and Reed make plans to excavate, but as they drill a test hole to peer inside there’s word of something strange happening in Klamath Falls, Oregon – nearly everyone is suffering from an unexplainable disease and many have died. The only residents unaffected are the children. © 2018 by Tim Ryerse & Scott Forslund. 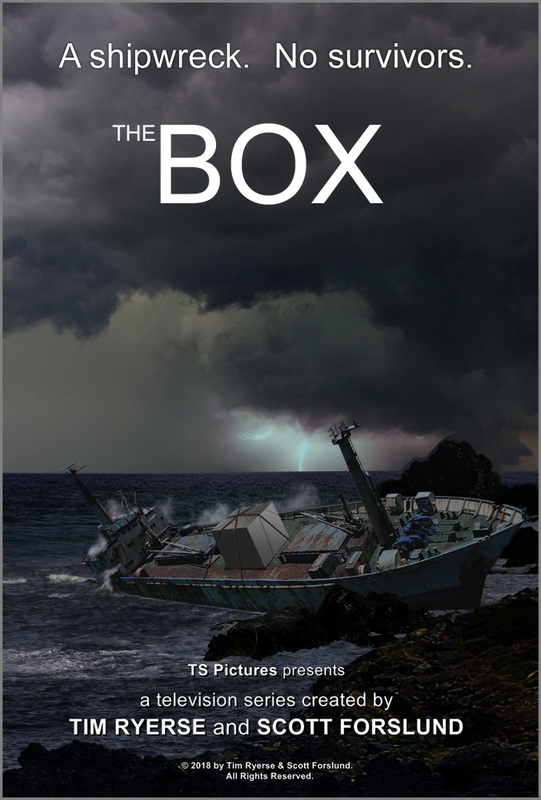 Episode 1 of The Box teleplay is available upon request for those interested in this project. Please contact us for a link to it and other information.